I love fishing for anything that swims and almost always fish as light as I possibly can as I believe it helps me get more bites and the action is always hectic once you are hooked up! 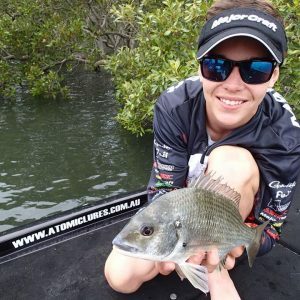 I got my love of fishing off my old man and recall countless nights tucked up warm in my swag by the fire on the beach, the peaceful scene shattered by Dad’s screaming reel (or indeed Dad screaming), to the pull of a huge mulloway. Early morning was spent spinning for tailor (lunch) . Through the day,while dad caught beach worms , mum would give me a lesson in bream and whiting fishing. It was an ideal upbringing which I am passionate to continue and share. I also got my appreciation for quality tackle at an early age, dad refusing to use any other hooks but Gamakatsu. For the last two years most of my fishing efforts have been focused on fine tuning my lure fishing for bream. The feeling of fooling a big bream into eating your artificial lure especially on a tournament day is indescribable. It is the highest of highs. Bream are an extremely smart fish and can be frustrating to work out at times but it’s always a rewarding feeling catching these slow growing, beautiful fish. My love of tournament fishing extends beyond the actual fishing. It has given me the chance to fish all up and down the east coast in some amazing arenas. It has also given me the chance to meet some incredible people, Tim Morgan, Steve Morgan, Tracy Mammen, Michael Starkey and Peter Macor just to name a very few. They are normal everyday people like you and I and are very keen to share all their enthusiasm and knowledge about fishing to any one. There is one fish you simply cannot fish lightly for and that is the mighty drummer. In the colder months drummer fishing off the rocks on my local headlands is always something that I look forward to . This is white knuckle, locked drag ,tug of war fishing. These fish are like mini tanks and go harder pound for pound than anything living in the ocean. Beware!! this form of angling is addictive. Tailor in rivers can often be a pest when targeting more desirable species like bream and flathead, but when you’re on a rocky headland spinning with metal lures or off the sand at dawn or dusk, it’s a very exciting and explosive hit which makes this an awesome style of fishing and something I can’t get enough of. I am definitely a tackle rat and love collecting/using all kinds of tackle. My favorite lure depends on the season but if I was forced in to picking only one to use it would be the atomic 38 deep in one of the more natural colours like muddy prawn ,ghost gill brown and the new Tim’s Prawn. Even though this lure has the ability to dive deep it can also be used as a shallow diver by holding your rod tip high and winding slow. I even fish them on the surface with a slow roll. I have been very fortunate to have just been sponsored by ‘’Majorcraft rods”,through Frogley’s Offshore who distribute the Japanese designed rods here in Australia.You don’t know a lot about the brand here yet but it won’t be long before you do. Majocraft have 70 to 80% of the rod market in Japan and are of a very high quality. So please feel free to follow me on facebook (Cohen Morante) and I will look forward to answering any questions you may have regarding fishing and in particular using/chosing any Frogley’s offshore products.